We were so excited to hear from Victoria, a localist editor from Flare magazine! She let us know that we were going to be listed as 1 of the top studio's to see in Canada in their March 2018 issue of Flare Magazine. As a studio we couldn't be happier to make this list, and hope we can meet and ink many new clients in the upcoming year! Congrats to Kyle, Eldrick, and Michaella for doing such amazing work. We re proud to announce that Sin on Skin Tattoo Studio has maintained our A+ rating since we've been accredited. We take great pride in knowing that we have kept up to their standards of good business practice. 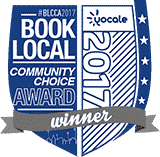 In 2017 Sin on Skin Tattoo Studio received the Yocale Book Local Community Award for tattoos in Halifax. We received this award for our commitment to community mindedness, and local initiatives in the Halifax Area. 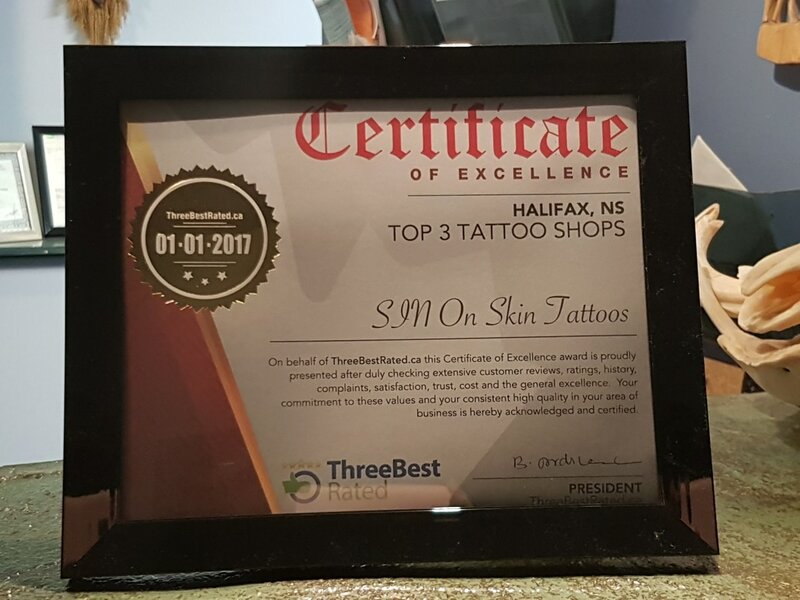 Three Best Rated awarded "Top 3 tattoo studio's" for Nova Scotia. 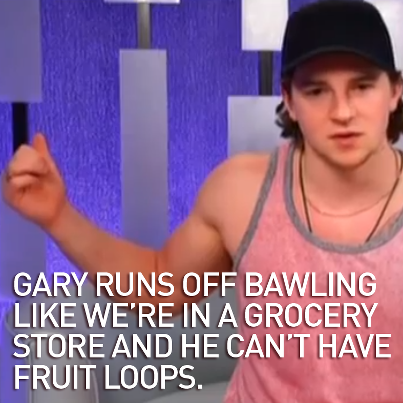 How can they actually say this? Their 50-Point Inspection includes everything from checking customer reviews, history, complaints, ratings, satisfaction, trust and cost to the general excellence. You deserve only the best! Everyone at the studio is honored to have received the Three Best Rated Top 3 Studios to see in Halifax, Nova Scotia top spot! After spending the entire 2016 year at the top of their list, in Jan 2017 we received notice that we had been selected as their top 3 tattoo studios . 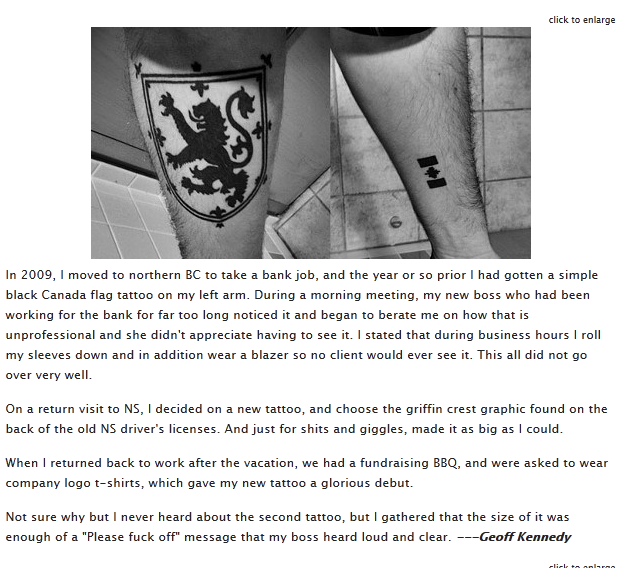 All studios are handpicked Top 3 Tattoo Shops in Halifax. They judge you by work quality, client experiences, cost, client reviews, social media presence, and online standing. We love the fact they take their time to really track each business on multiple levels to ensure you only receive the best recommendations! You can't buy your way into their system, it's all based on the business itself. We hope to have many more years on the Top 3 list!! Sin on Skin was awarded the Three Best Rated "Award of Excellence" for providing consistently high quality in our area of business, TATTOOS!!! Thank you to all at Three Best Rated as well as our amazing clients/friends who make us what we are and hope to spend many years on your list! 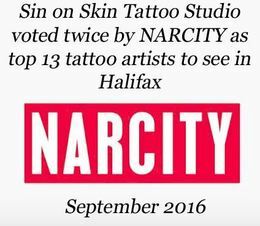 So happy to be chosen twice in Sept 2016 Narcity Halifax top 13 Tattoo artist to follow on Instagram! Thank you so much for the recognition. CTV's Ana Almeida stops by the studio for some questions and some new ink! Sin on Skin Tattoo Studio was happy to take part in this fun and educational social media documentary photography project by Doug Currie. Doug came by the studio to spend some time with us and our clients, so he could get first-hand experience of the process of getting a tattoo and who was part of this explosive trend. He spent a few days with each artist and their clients, asking them to tell their story and what made them get the tattoo they were presently sitting for. Blaze, a chef, and musician was getting his Phoenix rising from a frying pan on his chest, while Taylor was getting a piece to represent her past/childhood, a scenic tattoo showing the view from her childhood home. Every tattoo tells a different story, that's why we love our job so much!!! When a new client told us she was approached by a writer for the local Wolfville paper; The Grapevine, we were thrilled for her. Cassaundra had just had a beautiful rose shoulder piece done by Eldrick and was sitting at a local cafe when approached. She was asked if she would mind telling her story and allowing them to take a few pictures for their "Show me your Ink" section on page 18 in the Dec 11th 2014 issue of the paper. After agreeing and having her picture taken ,she gave a quick interview for their upcoming issue. She was beyond happy with her soft pink roses and even happier to show them off for all to see. Imagine having your world turned upside down at Christmas by finding out your husband and family provider was just put on life support, you work a part time job with 3 mouths to feed and Christmas coming up as well as all the bills that go along with everyday life, knowing there's no way you can do it all.. On a part time income, she knows she can't give her 3 kids: a boy 12 and 2 girls 8 and 14, the Christmas she wants for them, so that's where Sin on Skin and YOU can step in. Sin on Skin Tattoo Studio in Halifax is asking all the good people here to find it in their hearts to help this young family make it through this season and try to give them all something to smile about. A young mother with 3 children can't go without her husband and lose Christmas for her children on top of everything. We are excepting donations of FOOD, gift card's clothes/necessities, TOYS for the children, and of course a financial contribution if you can. We will be receiving items until Dec 23rd at 4:00 to ensure anyone who wishes to contribute will have time to do so. We've also received some beautiful handcrafted pieces of jewelry to auction off at the private event being held to raise money for the family in mid-Dec. We're open to any auction items you may want to donate to the upcoming event. There has been over $500.00 raised for the family's debt, a few toys have been generously given by Cassandra Francis, one of our clients Kelly Baylis- Smith has donated $100.00's in household necessities items that the family will be so happy to receive and to top it off a wonderful local business has donated all the food needed for her and her family to have an amazing Christmas Dinner!!!! Please contact us through our website, email, Facebook, or Twitter to go over any donations you may have or to arrange a pick up if needed. All items can be dropped off at our downtown Halifax Studio at 5239 Blowers Street- top floor unit, Monday-Saturday 12:00-6:00 daily. 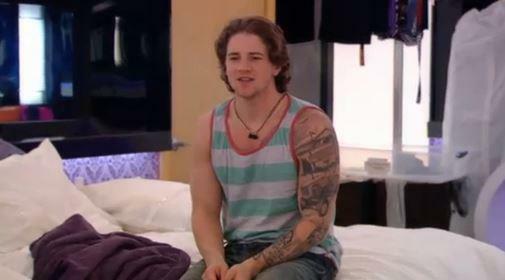 We were so excited to see one of Kyle's clients in the BB house this year showing off his incredible work. 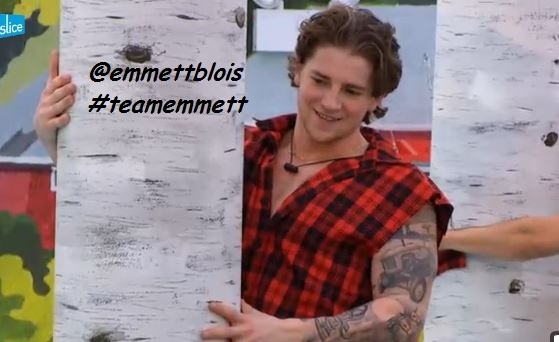 Our client Emmett Blois was one of the house guests fighting for the title of Canada's first Big Brother winner. If you tuned in you'll know he almost made it to the end, final 3, before being evicted by Gary Glitter. Who ultimately lost the title to Emmett's showmance Gillian. 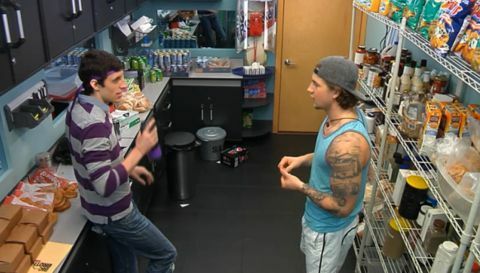 Check out the BB official web-page for Big Brother Canada info and news. Glad you brought so many tank tops to show off your work Emmett! Pick up a copy online and read the article about Celtic tattoos and their meanings, we really enjoyed doing this article. It's an informative magazine about everything Celtic. among Canadians. Medical bracelet tattoos are becoming very popular among those who suffer from metal allergies and can not wear the traditional bracelet. Also for those in the military, having your blood type tattooed can be a life saver in many over seas situations. Sin on Skin was contacted in February 2012 to take part in an upcoming article about medical tattoos. CMAJ showcases innovative research and ideas aimed at improving health for people in Canada and globally. It publishes original clinical research, analyses and reviews, news, practice updates and thought-provoking editorials. CMAJ has an impact factor of more than 9 and the website receives over 2 million unique visitors a year. CMAJ has had a significant impact on medicine and health care in Canada — and the world — over the last 101 years. 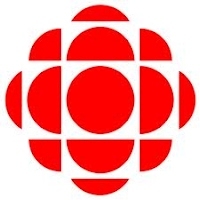 In Canada, the journal has played a key role in raising awareness of health and medico-social issues on topics such as the link between sun exposure and skin cancer, the dangers of smoking, contraception, euthanasia and other topics. It celebrated its 100th anniversary in 2011. 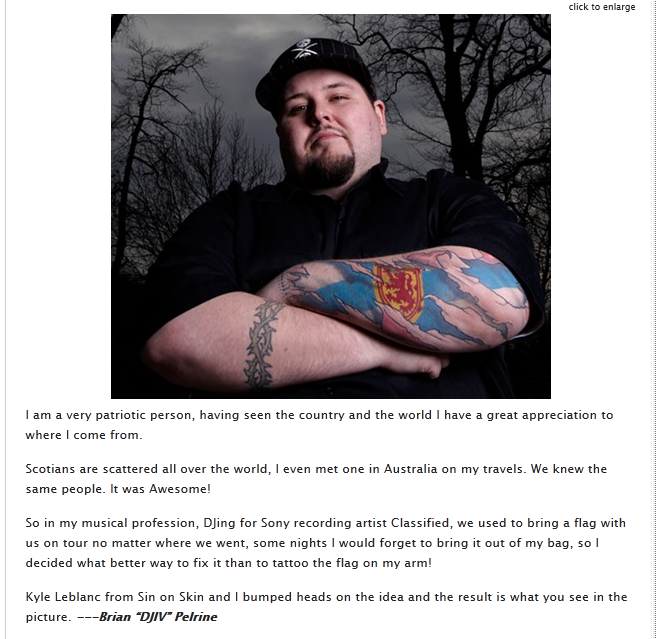 Eldrick was the artist that did this amazing job on the Nova Scotia crest. The boys all had fun with this contest. 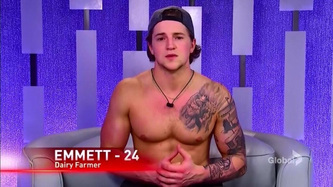 The first was Scott when he did a surprise piercing for one of the contestants - needless to say it was a long ride home on his scooter - very bumpy! One of our clients Angela Parlar (above) is shown here at the Calgary Tattoo Convention. She was handpicked out of the festival crowd to have her tattoos shown off in their next issue of Skin & Ink Tattoo Magazine in September. They asked for pictures of her amazing mermaid and underwater themed sleeve done by Kyle LeBlanc. Appearing on numerous TV & Radio shows over the years, doing interviews and in shop tattoo sessions with Much Music, Maritimes Today on Global & Global News, CTV News, CKDU Radio, Q104 radio station and taking part numerous times in Fear Factory nights at the Palace. 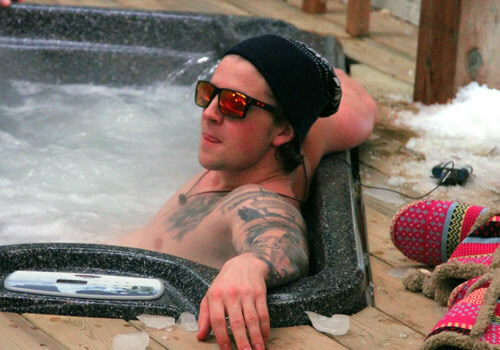 While also keeping a good hold on the print media in Next Magazine, the Calgary Newspaper, Chronicle Herald, The Coast, Skin & Ink Tattoo magazine, as well as numerous smaller publications that requested him for Q&A sessions and interviews. His door is always open to help educate potential clients of the proper techniques to be used prior, during, and after a tattoo session.